Mongolia is landlocked between China and Russia in the heart of Asia. For centuries after the disintegration of Genghis Khan’s empire it was ruled by one neighbor or the other, but in the 1990s the Mongols abandoned Soviet socialism and turned to democracy. Proud of their heroic past, they are rebuilding their national heritage. In the transition to a market economy Mongolia is a land of pioneers. Its greatest asset is the Mongol people, who are friendly, well educated, and ambitious. The first foreign language, once Russian, is now English. Its business leaders are striving to develop their resource-rich but infrastructure-poor country through international partnerships. The freely elected parliament has formed a series of coalition governments, aiming through consensus and sustainable growth to end poverty and inequality. The broad pasturelands, with herds of grazing livestock and the traditional nomadic lifestyle, contrast remarkably with the busy streets of the capital. Ulan Bator is a bustling city of over a million people, modern buildings and shops, interspersed with Buddhist monasteries and temples and surrounded by crowded suburbs of traditional felt tents. Culture Smart! 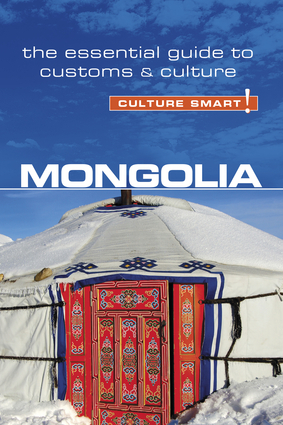 Mongolia provides vital insights and useful tips for those who want to get to know the country and its inhabitants. Chapters on the social, business and cultural life of the people, as well as the customs, attitudes and values that have shaped them, open up the rich human dimension of the "land of blue sky". Whatever your reason for travelling, it will enable you to embark on your journey with greater confidence, more understanding and increased sensitivity: a worthy aim. When entering a house or family ger, (traditional Mongolian Yurt) don't step on the threshold - it is thought to bring bad luck!